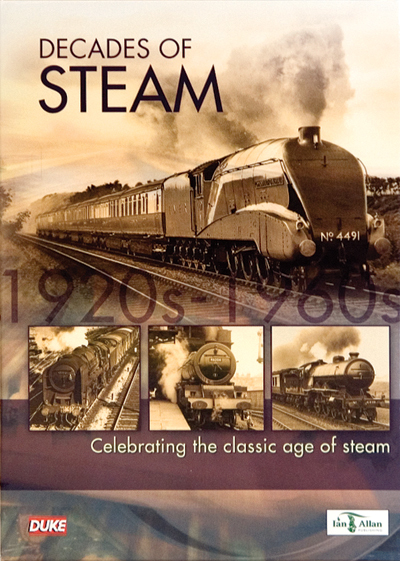 Created in association with Ian Allan, this handsome five disc collection is a sumptuous journey through the last decades of the steam age. From the end of the First World War and the dawn of the 'Big Four,' to the last steam workings on British metals in the late 'sixties this splendid five hour trip uses only original archive footage. Here you'll see authentic footage of the finest products of Swindon, Doncaster, Darlington, Derby, Brighton, Eastleigh and elsewhere in their natural habitats. Gresley's magnificent 'Pacifics,' Ivatt's 'Atlantics,' 'Duchesses' and 'Princesses' from the gifted pen of Sir William Stanier and the coppered and gilded offspring of generations of 'God's Wonderful Railway' CMEs are all seen putting in an honest day's work. Rare archive shots show how the railways coped with the Second World War, the onset of nationalisation and the dawn of the diesels. From the glory days of the highly-polished GWR, LNER, LMS and Southern to the dusty, rusty evening star of British Railways, take a nostalgic trip back in time. All-in-all there is something here for every steam fan and it is also a treasure trove of information for modelers in all scales, showing just what Britain's railways looked like over fifty years.